The Standing Desk Chair: An Oxymoron? We’ve taken a look at some of the stools designed for use with standing desks before and they’re all solid choices. Sure, they’ll get you off your feet for a while. However, there are times when you are likely to need the more supportive comfort of a conventional chair. When it comes to choosing a comfortable and supportive office chair for use with a standing desk, there are a few things to consider. How Much Should You Spend On Your Chair? Even if you plan to sit in your office chair for only a few hours a day, you should buy the highest quality chair you can afford. This is not to say that the most expensive chair on the market is necessarily the best. But, when it comes to office chairs, there is a definite correlation between price and quality. Most really high quality office chairs start at around $600 and you can expect to pay anywhere between that base price and $1500. 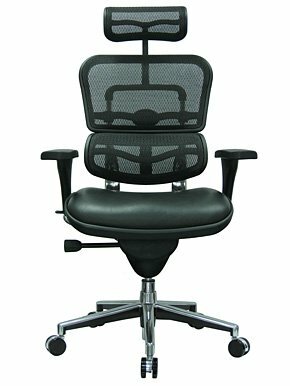 Of course, if you do happen to find the perfect office chair for your body at a price point of $200, then by all means, go for it. Just don’t choose something you know is inferior with the idea of saving money, unless you really can’t afford anything else. Your office chair is an investment in your physical health and it will have a direct impact on how well you can perform your job. Make sure the chair is adjustable, particularly in terms of height if you plan to use it at a standing desk, but in other ways, too. Can you adjust the tilt of the seat back? It should be able to be positioned so that your lower back is supported in the S-shape that is considered most ergonomically sound. Can you extend and/or tilt the headrest? Can you remove it? What about the arms? Can they be lifted and lowered? Pulled in toward your body or pushed out? Can they be removed entirely? Some higher-end chairs even have adjustable seat pans, which allow you to control how far out the seat extends underneath your legs because leg and torso length vary widely from person to person, regardless of height. Take a look at the specifications for Ergohuman, which describe the various ways their chairs can be adjusted, to get a sense of what kinds of adjustments are available in the market. If you are very tall, you may have trouble finding a chair you can also adjust for use at a standing desk, simply because your standing desk will have to be particularly high. In this case, your best bet may be to purchase an adjustable height standing desk. If you are of average height, your chances of finding a suitable chair are much higher. 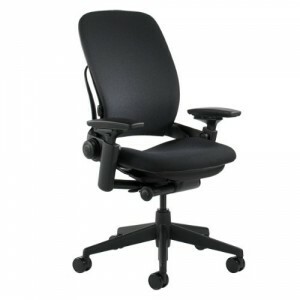 You can simply use a conventional adjustable office chair at the height intended for a tall user. If you’re of average height and you intend to use your chair mostly at your standing desk, consider purchasing a chair purpose-built for a taller user. 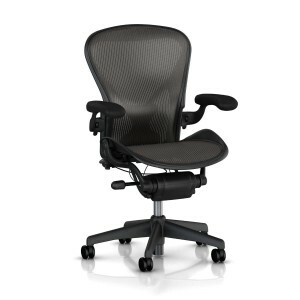 (Higher-end office chairs often come in at least two sizes, one for average users and one for tall ones.) You are also likely to want to purchase an additional footrest if the chair doesn’t come with a built-in one, to avoid the dangling leg syndrome. Is It Comfortable for YOU? If you’re buying a chair online, you can certainly read the specs to find out precisely how adjustable it is. You can (and should) also read the reviews from other users. But before you fork over hundreds of dollars for a chair, you really should try it out in person. So, even if you intend to shop on the internet (and many of the best deals are available online), you should make the effort to try out the chair either in someone else’s office or in a physical retail environment. At this point, as well adjusting the seat to your body and its needs, you should also carefully consider the material the chair is made from and the amount and placement of padding on it. If your work environment is chilly year-round for instance (perhaps it is air-conditioned), then you probably won’t mind a heavily padded chair in a nubbly fabric. However, if you work in a warm environment for at least some of the year, you might prefer a breathable leather and mesh chair.